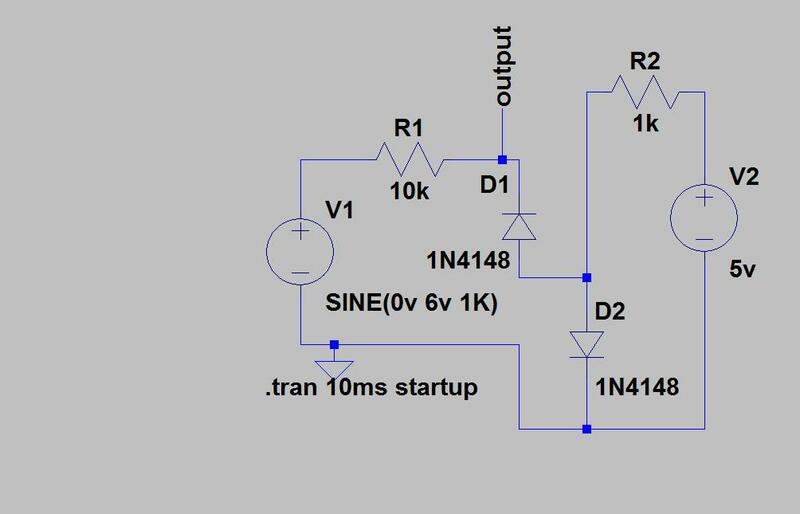 » Is this viable for precison half wave rectifier ? I'm trying to rectify and amplify an AC signal. I came up with this schematic. I'll probably be using LM358. I noticed the datasheet (TI) specifies that I shouldn't drive the inputs negative by more than 0.3v (See note 3). Therefore I added a diode (D4) to clip the negative cycle (I'd use either a Germanium or a Schottky diode -for low Vf). Now that the input is clipped, is the diode in the feedback loop (D3) really necessary ? See Fig. 45-46 on page 17. And consider an opamp with a higher gain-bandwidth product than the 358. Remember it's working open-loop until the diode conducts. This circuit is based on the fact that the op amp's -V supply is GND so it automatically cuts off the negative signal right ? And since that specific op amp is JFET input, it doesn't care about being driven low. This isn't the case for the LM358, is the clamping diode at the non inverting input enough ? I might also consider changing the op amp to a JFET input one. The LM358 is a century old, now just an average hobby quality opamp. There are many opamps which are similar to the AD823 mentioned above. 2) The output does not go absolutely to zero during the half cycles you are trying to remove. This is true of any op-amp but and LM358 is even worse than most for this. Solution: Use one of the standard circuits. Something wrong with the 2 amp solution I linked to? Just use fast amps and fast diodes, and it will work over the full audio range. I always liked the TL072. I've just used TLC271 for a similar purpose - though I'm working only at low frequencies, I need effectively zero current and high temperature capabilities. Something wrong with the 2 amp solution I linked to? ... I always liked the TL072. I only need to clip the negative cycles (half wave rectifier), and the circuit seems kind of weird since the first op amp seems to be in inverting configuration (I could be wrong) and how would that fair with a single supply ? Also, I had rather hard time finding a fast "modern" low cost op amp, but obviously I don't know much about op amps. TL072 seems to need at least 7v to work which is way too much for me. (Guess I've forgot to mention it needs to work with as low as 3.5v). 1.I just wonder, what would be the typical time it takes to come out of saturation ? How different is it for "last century" op amps and the newer models ? 2.I don't really need to have exactly 0v output, even couple of hundred milivolts are ok for my application. Even though the lm358 datasheet claims it can go down to gnd.